Radio observations made with AMI-LA as part of the 4 PI SKY project have revealed the presence of a relativistic jet from a Tidal Disruption Event (TDE), as presented in a new paper published in Science (van Velzen et al., link below). In a TDE, a more or less normal star strays too close to a supermassive black hole, is tidally pulled apart and ~50% of it accreted by the black hole. The other ~50% gets ejected from the system. 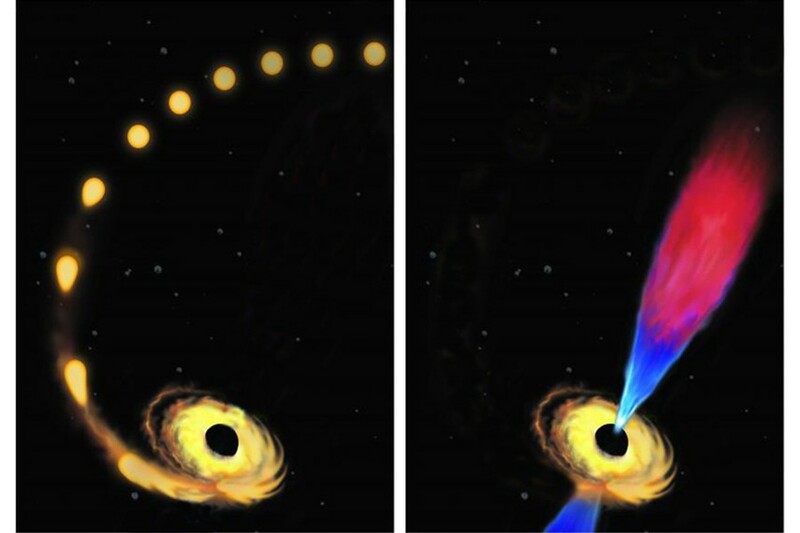 Artists impression of the tidal disruption of a star by a supermassive black hole, subsequent accretion and jet formation. The radio observations with AMI-LA were performed rapidly after the All -Sky Automated Survey for Supernovae (ASAS-SN) team classified the optical transient as a likely TDE. The novel aspect of the data is that for the first time a relativistic jet, implied by the radio flaring, has been found from a TDE which was discovered optically, where the optical emission arises from the accretion flow. Previous radio-detected TDEs have been entirely dominated in their emission by the jet, implying they are being viewed down the barrel of the relativistic outflow. This detection, likely to be off-axis, suggests that a large number, maybe all, of TDEs will be associated with radio emission. This in turn implies that, despite this jet being relatively weak compared to the first TDE jets discovered, the Square Kilometre Array should find over one per week such events when it starts taking data in the early 2020s. 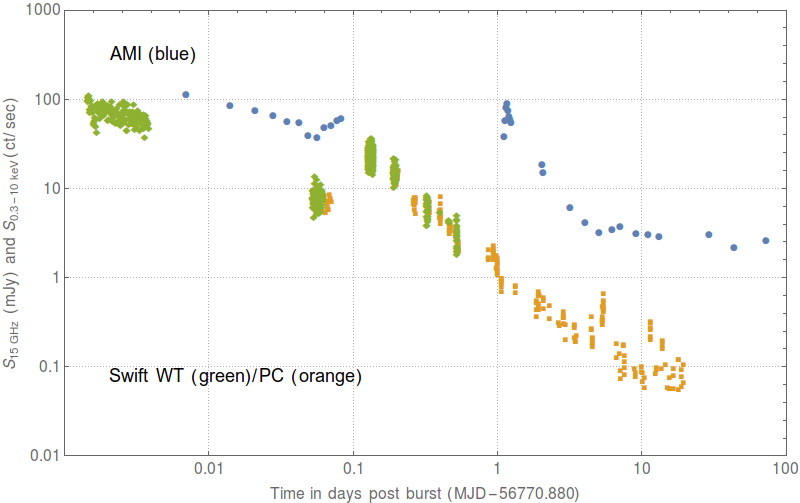 X-ray, near-UV, and radio light curves of the Tidal Disruption Event ASAS-SN 14li, from van Velzen et al. (Science, 2015). The 15.7 GHz data, crucial to the jet interpretation, are from our AMI-LA programme. The final intriguing aspect about these observations is the fact that the supermassive black hole into which the tidally disrupted star was accreted, was already active, as indicated by earlier radio observations. This implies that the star entered on a orbit towards the supermassive black hole through the pre-existing accretion flow, disrupting it as it went. We plan to chase all future bright optical TDE candidates to try and repeat this success and prepare the ground for MeerKAT and SKA. 4 PI SKY team members Gemma Anderson, Tim Staley and Rob Fender are all co-authors on the paper. After 26 years dormant, the nearby black hole V404 Cyg went into outburst on Monday last week (June 15). Many of the world’s premier observatories are following this spectacular outburst, which is likely to yield the textbook event for black hole accretion for many years to come. The 4 PI SKY team are at the forefront of efforts to collect data and understand this source. 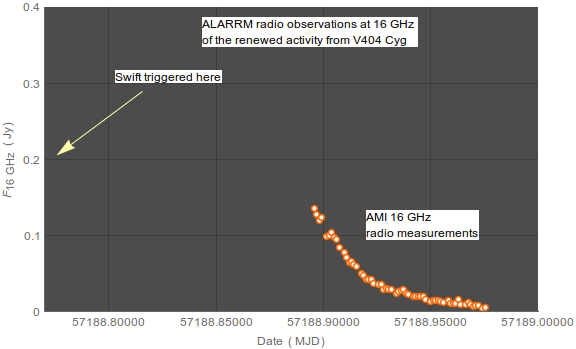 Most notably, the AMI-LA telescope in rapid response mode (ALARRM), was triggered by a Swift X-ray alert on the source and obtained radio data only two hours after the trigger, revealing already a bright and declining radio flare (see figure below). Since this initial observation we have been following the source intensely with AMI and have detected a large number of radio flares, which are probably associated with relativistic ejection events. 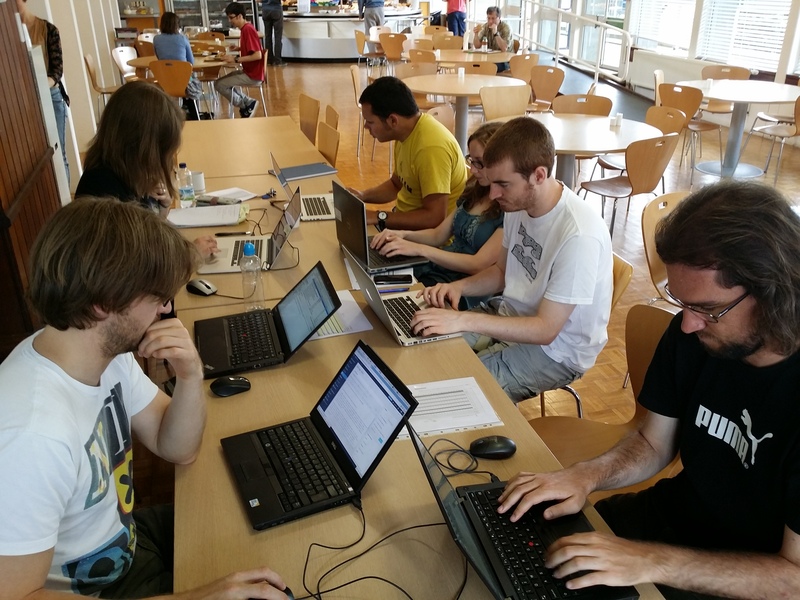 4 PI SKY team members are also involved in radio observations with other major facilities such as eMERLIN and LOFAR, and are leading aspects of the X-ray and optical data analysis.